See-Dub: Who (barely) won the Big 12 championship? Those "children of the corn" were certainly scary! Holy cow. I had a bad feeling about this game—for good reason, it turns out. Suh is a monster on D, and he held our offense to 13 points. Crazy! Our play-calling was pitiful for most of the game. Those dumb sideline passes WILL KILL ME SOMEDAY. The dropped sure-TD alone took a year or two off my life. And our return coverage? Why is it STILL so bad? I can't believe we haven't been able to figure out that part of the game throughout this season. Fortunately, our D returned to form and held the Huskers to four field goals. I'm so thankful for "Big Game Hunter" Lawrence and that huge field goal he hit with 1 second remaining. That kick gave my Horns their third Big 12 championship and sent us packing for Pasadena! When we booked our flight to California a while back, I titled the itinerary "Holding Our Breaths." But now that it's official and we're on our way to the BCS national championship game, I still can't breathe! My Horns have a whole lot of work to do between now and Jan. 7. But I BELIEVE! 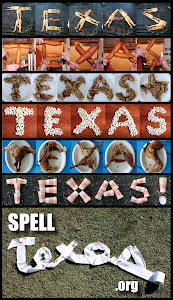 And you can bet we'll be spelling TEXAS in the Rose Bowl parking lot next month!